- Publisher Celebrate Christmas with our inspirational DayMaker Greeting Books - collections full of stories, quotations, prayers, recipes, and more. Be encouraged by topics like blessings, traditions, peace, joy, and the greatest gift of all - Jesus Christ, the Savior of the world, born in a humble stable. Marvelous message, fantastic packaging - all at the incredible value price of only $1.99 each! 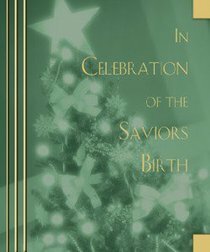 About "In Celebration of the Savior's Birth"
Celebrate Christmas with our inspirational DayMaker Greeting Books - collections full of stories, quotations, prayers, recipes, and more. Be encouraged by topics like blessings, traditions, peace, joy, and the greatest gift of all - Jesus Christ, the Savior of the world, born in a humble stable. Marvelous message, fantastic packaging - all at the incredible value price of only $1.99 each!